While facing economic challenges and prudently planning and developing for the future, this summer Southern Illinois University Edwardsville tackled more than a dozen building projects – large and small – that totaled more than $1.7 million. “In spite of financial difficulty in Illinois, SIUE is strong and is still investing in our campus,” said Vice Chancellor for Administration Rich Walker. The University’s ongoing construction projects have served to provide faculty, staff, students and visitors with the highest quality academic and student-focused structures in which to learn and enjoy campus life. “Each of these projects represents the University’s commitment to our students and faculty by investing in an infrastructure that allows them to excel in learning and teaching,” Walker said. School of Engineering Student Design Center: The project built a new two-story Student Design Center onto the existing Engineering Building. The addition includes work space for engineering students’ design teams working on special projects used in academic competitions. Among the student organizations benefiting from the Student Design Center are SIUE Solar Car, Cougar Baja, Formula SIUE and IEEE Robotics, as well as the Steel Bridge, Concrete Canoe and GeoWall Teams. The space will also be used for capstone senior design projects that require design, fabrication and assembly. Nutrition Lab: This newly constructed cooking lab for the School of Education, Health and Human Behavior (SEHHB) is located on the second floor of the Vadalabene Center and was completed with a matching gift donated by Senator Jim Oberweis, chairman of Oberweis Dairy, and his family. Science East Renovation: Work was completed on constructing a new auditorium. Ongoing renovation is being done to construct new offices and classrooms, with move-in projected for Summer 2018. Pedestrian Campus Walk Replacement: The first of six phases was completed by replacing sidewalks across the University, including pieces around Rendleman and Peck Halls. The project also involves installing handicapped accessible ramps where needed. Other maintenance and projects completed or in progress include: Recreation Complex synthetic turf work, Alumni Hall patio repair, Lovejoy Library south entrance work, Dunham Hall elevator removal and structural repairs, Morris University Center tunnel repairs, Art & Design East window replacement and kiln area roof work, water system valve replacement and Ralph Korte Stadium leak repairs. 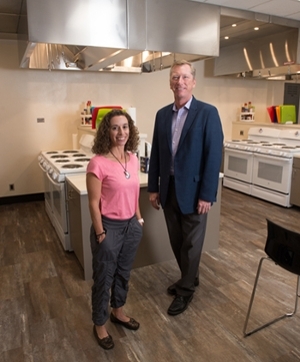 Kathy Mora, PhD, RD, assistant professor in the Department of Applied Health, (left) and Vice Chancellor for Administration Rich Walker are shown in SIUE’s new Nutrition Lab. 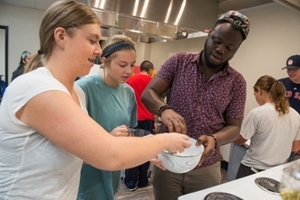 Participating in a food science course held in the Nutrition Lab, are students (L-R) Hannah Burger, SEHHB senior, Isabella Ilch, SEHHB sophomore; and Mayor Akinpelu, CAS senior.